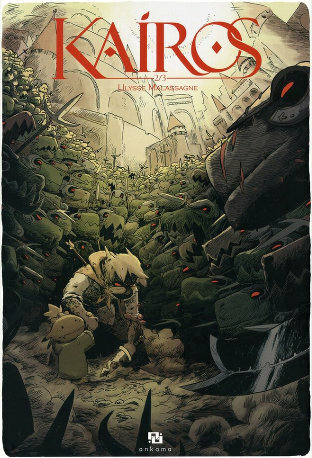 Kairos, volume 2 of 3, is out! (My thanks again to Lex Nakashima for making this review possible.) Volume 1 was published in France in April, with an animated cartoon trailer for the whole series by the author at his new Studio La Cachette. Niils and his mysterious girlfriend Anaëlle (whom he is trying to talk into becoming his fiancée) are camping out in the French countryside. She is kidnapped by anthropomorphic dragons dressed as Medieval soldiers, and taken “home” through a dimensional portal to the world that she apparently came from in the first place. 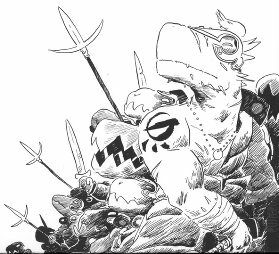 Niils follows to rescue her, and is met in the countryside by two friendly inhabitants; Kuma, a dragon monk, and Koyot, a brown, beaky peasant. Tome 2 begins with Niils, Kuma, and Koyot coming to a peasants’ market town, where a big political argument is in progress between the supporters of the dragon royal family and those who accuse it of becoming tyrannical, weak, and no longer in touch with the people. Roubaix, France, Ankama Éditions, October 2013, hardcover €11.90 (64 pages; on Amazon.fr). Niils recognizes some of Anaëlle’s kidnappers among the royal guard maintaining order between the two factions. He loses his temper and attacks the guards, demanding to know where Anaëlle is. Kuma and Koyot drag him off and all three escape. Niils goes on ahead, with Kuma and Koyot discussing that he is exhibiting more rage than love, and that when he becomes angry, Nills starts to change into something other than human. They come to the royal city, where the guards at first refuse to let them enter through the main gate. Kuma and Koyot are ready to back off and sneak in another way, when Niils becomes angrier than ever and attacks the entire dragon army. By this time it is clear that he is not human. The story divides between Anaëlle in the castle tower, addressed as princess by the Queen, her mother, who begs her to accept her royal responsibility and reestablish the dynasty’s link to the people which the king has abandoned; and Niils in the dungeon with the revolutionary leaders, who ask him to take over the leadership from them. Niils refuses, saying that he only wants to find Anaëlle and return with her to Earth. “You’re stupid,” says one of the rebels, “incapable of seeing any further than your nose. The love of your life who is kidnapped, and a princess who has just returned to her kingdom … do you really see no connection between them?” Tome 2 ends with the dragon royal guard prepared to defend the castle, and an advancing army of commoners led by Niils who is transformed halfway into a dragon. That summary includes about every spoiler that it could. 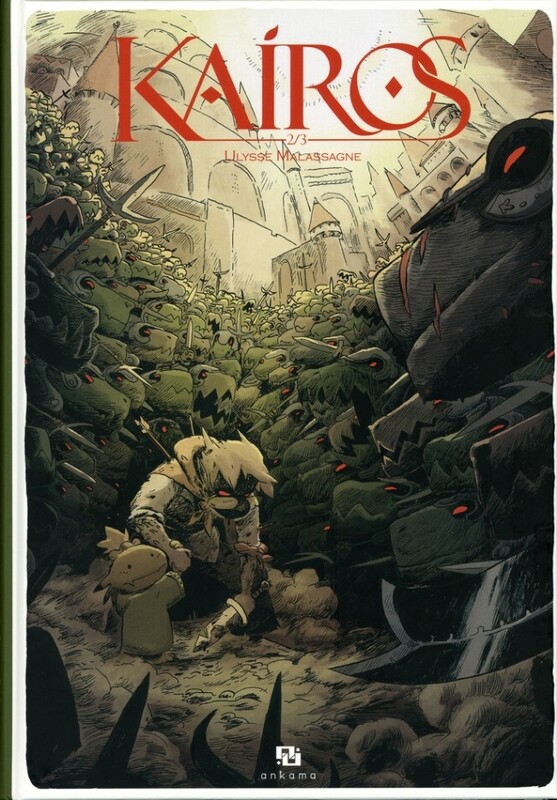 But it’s not the plot that makes “Kairos” a winner, but the way that Malagasse develops it, plus Malagasse’s art which is halfway between funny-animal cartoony and dramatic. It is simultaneously funny and suspenseful, and always fast-moving. Tome 1’s cliffhanger ending was whether Niils would find Anaëlle in a whole new world. Tome 2’s is just what Niils is, and what is his destiny? Tome 3 will wrap it all up. Any plans for Kairos to be released in North America? which looks AMAZING by the way!